American manned Mars orbiter. Study 1952. The first design for a manned Mars orbiter based on engineering analysis. 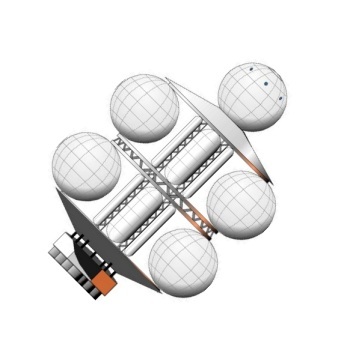 10 passengers would be housed in a 20-m-diameter sphere during the 963 day mission to Mars, in Mars orbit, and back to earth. Status: Study 1952. Thrust: 1,960.00 kN (440,620 lbf). Gross mass: 3,720,000 kg (8,200,000 lb). Unfuelled mass: 57,500 kg (126,700 lb). Specific impulse: 297 s. Height: 41.00 m (134.00 ft). Diameter: 20.00 m (65.00 ft). The Passenger Vessel would perform four major maneuvers: Trans-Mars Injection (3860 m/s), Mars Orbit Insertion (2200 m/s), Trans-Earth Injection (2200 m/s), and Earth Orbit Insertion (3600 m/s). Each crew member was allowed 120 kg of personal baggage. Consumable supplies totaled 12 metric tons of oxygen, 8 metric tons of food, 2.5 metric tons of food containers, 13 metric tons of potable water, 2 metric tons of utility water. Additional utility water would be extracted from the cabin atmosphere during the mission, sterilized, and re-used. Final empty weight of the passenger vessel in earth orbit at the end of the mission would be only 50.5 metric tons, only 1.4% of the 3720 metric ton departure mass. Crew Size: 10. Structure: 11,800 kg (26,000 lb). Reaction Control System: 1,000 kg (2,200 lb). Navigation Equipment: 3,000 kg (6,600 lb). Electrical Equipment: 2,000 kg (4,400 lb). Communications Systems: 1,000 kg (2,200 lb). Crew Seats and Provisions: 5,500 kg (12,100 lb). Crew: 800 kg (1,760 lb). Miscellaneous Contingency: 3,700 kg (8,100 lb). Environmental Control System: 20,000 kg (44,000 lb). RCS Fine No x Thrust: Flywheels. Spacecraft delta v: 12,000 m/s (39,000 ft/sec). Family: Mars orbiter. People: von Braun. Country: USA. Spacecraft: Von Braun Mars Expedition - 1952. Propellants: Nitric acid/Hydrazine. Bibliography: 373, 49, 591.